The protest site in Great Siege Square has been wiped out again in the dead of night. We weren’t sleeping there to guard it because we have children and homes and jobs to go back to. 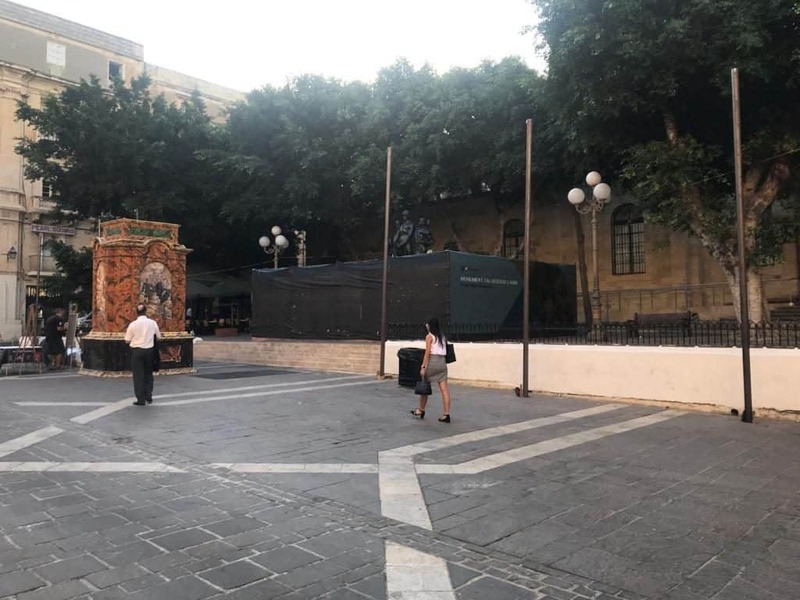 Joseph Muscat also had a home to go back to so he had government employees strike down the flag of Malta and dump it in a trash can on his behalf instead. After they were caught red handed just last week it is impossible not to be convinced it was government employees acting on instructions that vandalised the protest site. Do not flinch at the contempt they have protesters. Nothing new there. Think of the contempt they have for the court that has ordered the government to declare its intentions for the memorial within 10 days from last Saturday. Instead of replying, like criminals, they went in the dead of night to rip the whole thing down. Think of the contempt for a European Parliament human rights delegation landing here momentarily. There isn’t even the pretence of decency left anymore. Great Siege Square has now truly become the frontline for the fight for basic liberties in this country. We asked for temporary protection from the courts and did not get it but that does not mean we’ll stop asking. We were rather better served by the police this weekend and I have turned to them again today to have the stolen items of protest returned to us. Lawyer Karol Aquilina has filed a formal police report on my behalf this morning. They will only stop doing this when they are overwhelmed by defiance. Do not wait for the 16th of next month. Go there today, tomorrow, as soon and as often as you can. Make your protest known. You can sing and dance if you’re so inclined but most people aren’t. Lay flowers or light candles instead. It’s not easy. The hecklers they leave there are scary bullies. Look them in the eye. That usually shuts them up. And you know someone will come to remove what you leave. Nothing is more disheartening than futility. But if we all do it and we all do it often and long enough, it will not be for nothing. Roberto Saviano on the government’s efforts to abolish the memory of Daphne Caruana Galizia. And the resistance against it.